Let Us Help You Plan, Plant & Enjoy! Paeonia ‘Bartzella’, 6-8″ butter yellow flowers- Amazing! 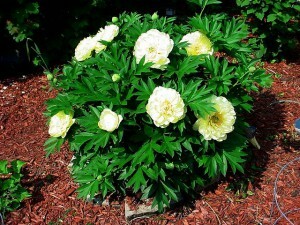 A Garden Crossings new introduction for 2012, Peony Bartzella is really showing its colors. The butter yellow, 8″ double blooms load this beautiful plant full of color. Peony Bartzella has an extra long bloom time, the plants send out new growth from the side creating more blooms for later blooming. Bartzella is a new cross of the herbaceous garden peony with the woody tree peonies. Due to this excellent breeding, staking is NOT needed. ‘Bartzella‘ would be a great choice for landscape design because of its tidy habit. One of the most popular annuals for hummingbird attraction is Salvia ‘Black & Blue’. Although it is not the typical color for hummingbird attracting , which is red, this Salvia does a wonderful job! The intense blue flowers bloom off of black stems. This tall, 30-40″ sun loving annual is great for in those hard to grow dry areas in your garden. The butterflies, hummingbirds, and song birds just love hanging out on this annual. Hardy for zones 7-10 this may also be considered a tender perennial in some areas of the country. Salvia ‘Black & Blue’ makes for a great garden addition along with a great thriller for your combination planters. The best part of this plant for those of you with deer problems, it is deer resistant! Here are a couple comments from other gardeners like yourself who have tried and love this variety. Brenda, Zone 6 -This is my 3rd year growing these salvia’s. I live in zone 6, so I have to reorder each year. I don’t mind at all though, because they are beautiful blue color and bloom all summer. The hummingbirds absolutely love this blue flower. Jaime Zone 8- Really, really nice plant! Bloomed for months – non-stop! I will always have 1 or 2 of these in the garden. For the past few years Echinacea have been all the rave. So many new varieties that come out every year, and us having to choose which ones to keep, drop or add as a new variety. Echinacea also have become a true collection. One of the new varieties that we added this year is Prairie Pixies™ ‘Cranberry Cupcake‘. One thing that I think people are looking for in cone flowers is a shorter plant but with large blooms. (correct me if I am wrong) ‘Cranberry Cupcake‘ is just that, a compact variety reaching 14 to 22 inches with tons of huge blooms. The large, double pom pom cone is a bright pink color with lighter pink rays that fall from it. Just the name of this plant may lead you to also think that it is a fragrant variety, which it definitely is! And with fragrance comes… you guessed it butterflies and hummingbirds. This delightful variety is a sure bet garden treat! Be sure to check out our other 40 Cone Flower Varieties! Garden Crossings is a great place to start your Echinacea collection! If a long blooming perennial is what you are looking for, Agastache should be a high on your list. Agastache ‘Blue Boa‘ is a beautiful new perennial variety that has bright purple flower spikes that bloom all summer. The tall (2 -3 foot) upright habit of ‘Blue Boa’ and thick colorful spikes make this a great specimen plant. What I have done and recommend doing is planting several Agastaches together in mass to create a colorful long blooming ‘patch’ in your garden. The sweet anise smell is delightful on a warm summer night. Take a few cuts and bring this beauty in the house to enjoy. Agastache ‘Blue Boa‘ is a natural attractor for hummingbirds and butterflies, and because of its lovely scent the deer will stay away. Be sure to check out our huge list of Agastache to start your long blooming variety list. 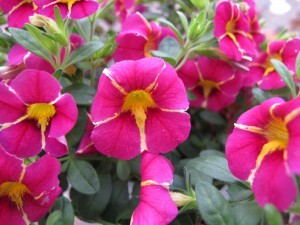 It was love at first sight when I first layed my eyes upon this new Annual from Proven Winners, Superbells® Cherry Star Calibrachoa. The intense pink color combined with the bright yellow star creates a shocking color combination. Planted alone or in combination, Superbells® Cherry Star is sure to turn a few heads. The mounding trailing habit of Cherry Star makes a statement in hanging baskets, planters and the landscape. Superbells® prefer to be planted in full sun and have well drained soil. To maintain a stunning planting all summer long we recommend using Water soluble fertilizer at least every other week. When your Calibrachoas start to look a little tired, we recommend giving them a slight trim to promote additional branching which will also encourage additional flowers. 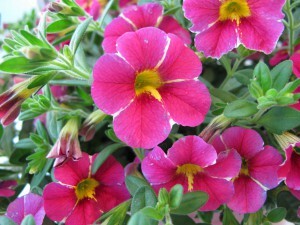 Try Planting Cherry Star with Ipomoeas, petunias, or other calibrachoa for great combinations. Copyright © 2013 The Garden Crossings Blog. All Rights Reserved.